software application and database needs. Run your Oracle EBS (R12+) and Oracle Forms (10+) Applications with the latest Chrome Browser (Windows and OSX) - no NPAPI required! Convert your Oracle Forms Applications into stand-alone executables & run Oracle Forms on OSX, Windows and Linux without Browser. No more NPAPI or browser incompatibilities. 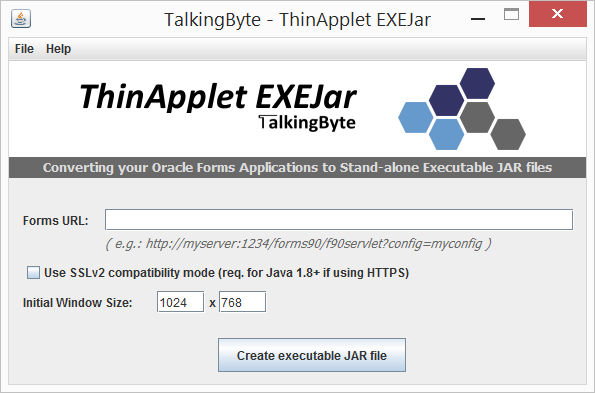 Run your Forms application with the native Java JRE (1.7, 1.8+) - on Windows, Linux and OSX (even if your server still uses jInitiator). TalkingByte is an IT solutions company with specialist skills in Database Technologies and Software Development. From our office in Brisbane, Australia we are providing high calibre IT consulting services to our customers around the globe. Is your browser/java version not supported by your Oracle Forms application? Google Chrome is complaining about NPAPI support? Does JInitiator crash your browser? Do you want to use Java 1.8? Then ThinApplet EXEJar is the tool for you! Support of old SSLv2 protocol, also under Java 1.8. Doubleclick the generated JAR file (or run with "java -jar yourapp.jar"). You can also use tools like Launch4j to convert the JAR file into a .EXE prior distribution. And its simple - just click here go to the Chrome Web Store and install the Extension. 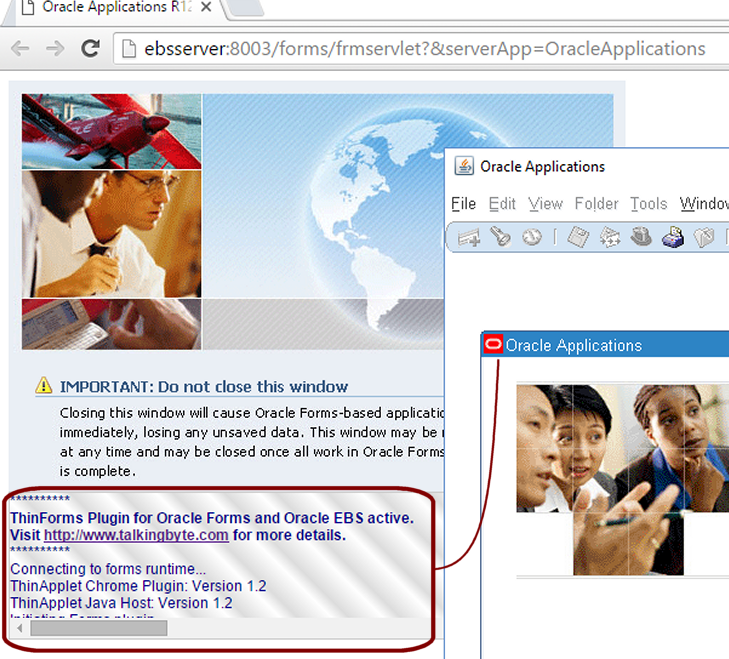 The ThinForms Chrome Extension keeps an eye out for Oracle Forms and Oracle EBS Applets. The ThinForms Chrome Extension and the Java Host Application are tightly integrated, and support SSO and cookies (e.g. for Oracle Reports authentication).